Mostly lost in the noise surrounding the World Cup final, a screenshot floated around the Microsoft-watching community. The image picked up attention because it contains what some claim is an image of the soon-to-return Start Menu in Windows 8.1. Microsoft promised that the user interface element would come back in a keynote this April. In the ensuing few months there hasn’t been much to go on in terms of new hints of what it might look like. I don’t like to post ‘leaked’ product images much, given their propensity to be fanboy-sourced fever dreams, but the design similarities to Microsoft’s own mockup are worth noting. 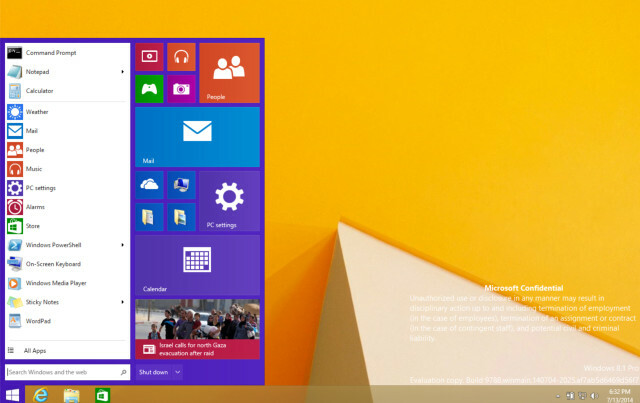 The real Start Menu, whatever it will look like, is expected to land in 2015. Whether the image is real or not, it’s been interesting to gauge reaction by Microsoft fans to its contents. Comment on Sams’ Neowin article ranged broadly — from positive, to dismissive. The overall lilt, if I had to ascribe one to something as chaotic as 140 blog comments, was generally positive. That’s a point for Microsoft. Though, fixing a self-imposed wound is only so impressive. Microsoft has been easing the line between the Metro aspects of Windows 8 and its desktop portion since the operating system first came out. The new Start Menu, likely a fusion of desktop and Metro components, continues that trend. I have a ping out to Microsoft for comment on the image. The company will respond sometime in the next few hours indicating that it doesn’t comment on rumors or speculation.